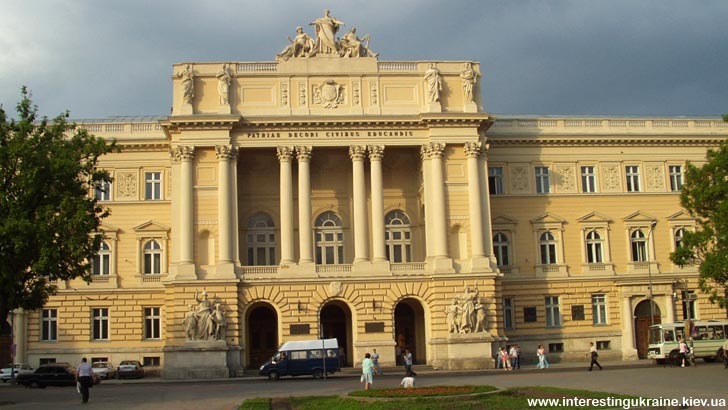 Lviv State University named after I. Franko has started functioning since 1919 in the building which was constructed in 1871-81 for Galician Seim (Parliament). The architect J. Hochberger created the project of the monumental palace in the style of classicism. The middle part of the building, which comes forward is the most embellished one. Over the portal, which consists of three arches, adorned on the sides with the allegoric compositions of «Education» and «Labor», there are monumental colonnades. Above on the attic there is one more sculptural allegoric group of sculpt. T. Rygier which bears the name «The Guardian Spirit of Galicia» with the figures «Galicia», «Dnister» and «Visla».